Why Don’t Men Want To Get Married? Sorry, but men wouldn’t get married if society accepted long term cohabitation. Society pressures men into marriage. They do it for women, because men are biologically programmed to do whatever is necessary to mate. What semi-intelligent man would enter into a contractual arrangement these days, knowing that over half of marriages end in divorce? Not to mention that women initiate divorce nearly 70% of the time, with the majority being ‘no fault’ divorces. Men want to cohabitate, sans the financial and emotional devastation. A long-term relationship is identical to marriage. One has requires an expensive ring, ceremony and divorce court attorney, while the other requires only love and commitment. Guess which one this man is choosing? I’m actually really happy Mark decided to leave his comment, because he is voicing a very common opinion amongst men. The benefits to getting married for a man are growing shorter each passing year. Mark is also correct with his statistics, 50% of marriages will end in divorce and 70% of those marriages are initiated by women. I have to admit, I was a little shocked when I learned that 70% of divorces were initiated by women. When I read this my first thought was adultery or perhaps there were a lot of abusive husbands , but this isn’t the case at all. 70% of divorces initiated by women are due to “no fault,” meaning there has been no wrong doing by either party to break the marital contract. Mark, also brings up a good point, that women expect a man to buy them an expensive ring (at least 3 months salary), and finance a wedding ceremony (minimum $10,000 for a cheap wedding) to prove their love. Men on the other hand only ask for loyalty and commitment, when they walk down the aisle. Don’t try to use the argument that the wedding is for the man as well. We all know the wedding is for the woman and this is coming from a man who believes in marriage. Don’t forget that a woman is also entitled to 50% of the man’s income after a divorce. Independent upon the length of the marriage and/or whether or not the wealth was generated before or after the marriage. Alimony was meant as a way to protect a housewife who had spent her time supporting her husband. Since she was not working, but was supporting her husband in his endeavors his income was her income. Therefore upon a divorce, half of his salary would have to go to support his ex-wife as this is what she has earned. I am in full belief of this principle. However, with most women in the workforce today, this tends not to be the case anymore. Yet, men continue to be fearful of getting married and losing half of their wealth to a woman that never helped them achieve it. Hence the over usage of the prenuptial agreement. The conclusion that many men are coming too is to just not get married. Do you understand now why it is so hard to convince some men to get married? Do you see why it is important to learn a man’s point of view on marriage, so you can understand what you need to do to convince a man to want to get married. Stop trying to force men into wanting to get married. Instead learn what you need to do to combat these negative perceptions about marriage, so your boyfriend will want to propose. It’s comments like these that made me give up dating and relationships all together. Also I have read a lot about relationships and signed up for many e-newsletters from male and female coaches and the only message I received from all of it was that all the pressure is on the woman to make the man happy. That she has to make all the changes. It’s ridiculous. My new year’s resolution is to just enjoy my self and my life and not live by anyone’s advice just by my own intuiton. See where life takes me. Thanks for the comments, Lisa and I can understand your frustration searching for information online can over saturate a person. However you must understand you attract what you are searching for especially online. 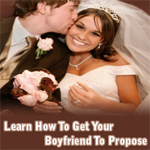 For example if you go on the internet and search for “How to get a man to commit or get him to propose” these websites will be geared towards women, because it is women who are searching for these solutions. I’m really shocked that Mark found our site and left a comment, because no men search for our site. With that in mind, with no men coming to our site there really isn’t an point in us telling men what they are doing wrong, because there are no men to hear the lesson. There are lots of coaches and sites that teach men what they need to do to change for a woman, but you have to be looking for them and I have the feeling you are not searching on the internet for “How to attract a woman or How do I get a woman to want to commit” If you did you would see that there are lots of things men need to do to become better partners in relationships. I know because I want to be a good partner so I have read and learned from many of these sources. 1) He is not ready or may never be ready because of issues that he has. If this is the reason then as a woman you need to know what factors to look for in a man to avoid these types of guys or know so you can cut your loses and move onto someone who is a better partner and interested in better satisfying your needs. 2) He does want to get married, but the woman is not meeting his needs to be married to her. This does not mean that she as a woman must change, but women have needs that must be met in a relationship and marriage. Men also have needs and if those needs are not satisfied he will not be interested in getting married. Becoming upset about that will not change the fact, that like women, men have needs as well and they must be satisfied before he will consider marriage. Nobody is saying you have to change as a woman, however would you want to be in a relationship where your partner is not interested in making you happy? I always try to satisfy my partner’s needs in a relationship because I want them to be happy and if they do not feel the same way that’s fine, but I have no interest in continuing a relationship or getting married to them. We do not give advice, all we do is express the internal thoughts and needs of men, you can choose to listen or not. I know whenever I have a problem I find it best to read and hear every possible source I can find, whether I like the opinion or not. One thing you can’t do is take someone else’s ideas personally, this article was not written about you and it was not saying you personally were the problem. As humans we all have flaws and shortcomings, the only thing we can do is be the best person possible. We can not change anybody else, but we can improve ourselves and that is something we should all strive for each day. And never thought he would ever live again. We want to spend our lives together and all plans are for that to happen this year. However he doesn’t want to get married because of previous marriage and while I’m not ok with it, I’m able to deal with it because from reading your articles I understand where he may be coming from with regard to his feelings about marriage. Your articles here has given me a good insight into how men really think about marriage and realise that it’s not about me but their life experiences which often firm their views about marriage.